Terremark’s Enterprise Cloud is based on the “Infinistructure” platform, a mix of servers, storage, and networking with a self-service portal digitalOps. The software part of the Infinistructure Utility Computing platform is based upon VMware’s vSphere virtualization platform and makes use of vMotion, load balancing and Dynamic Resource Scheduling (DRS). You can create a server in a few minutes by using the templates that Terremark provides (“Create Server”). This instructional movie gives a quick overview how this is done. It is a simple and straightforward process that takes 10-15 minutes at most. The digitalOps environment interface has three tabs: Resources, Devices, and Network. The Devices tab lists all the virtual machines you have created so far. The virtual machines can be sorted/grouped as you can see below. Creating servers (using the “Create Server” option) from the Terremark templates was very easy, but the "Create Blank Servers" option was a different story. It was not possible to mount our own ISOs. According to Terremark, this will be fixed in the next release, as you will be able to import your own Open Virtualization Format (OVF) virtual machine. Installing ISOs will not be possible yet. 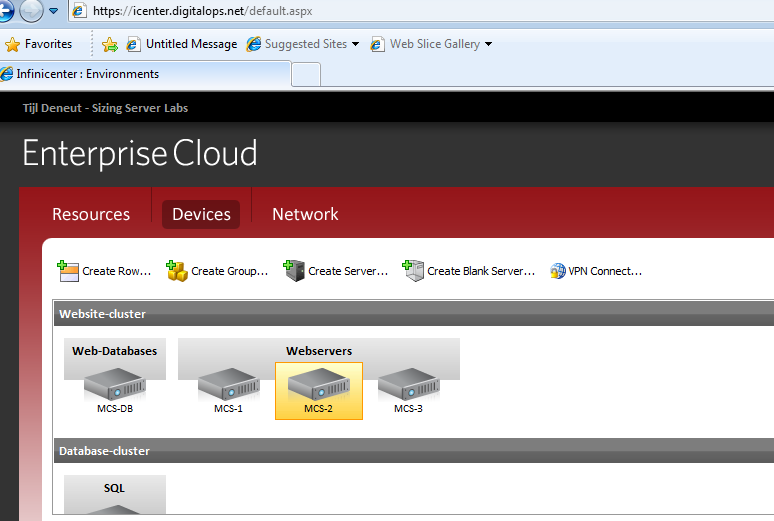 The Resources tab gives you the real “cloud computing” or “IaaS” feel. Your “cloud data center” is a collection of a specified amount of processor GHz, several gigabytes of memory space, and storage usage. You also get a summary of how much of those resources you have used the past 24 hours. Renting 5GB of RAM is pretty straightforward: it means that our applications should be able to use up to 5GB of RAM space. If the pools are well dimentioned, this should almost never happen. THat is designing resource pools, if a service company is that idiot they will run out of business. Although swapping on SSD (certainly on next gen vsphere) is another way to avoid the slow performance as much as possible it is still slower and provides Hypervisor overhead. Hi, please include costs of the systems benchmarked... in the case of the Cloud, in $/hour or $/month, and in the case of the server, a purchase price and a lease price would be ideal.